I love Amsterdam for the canals, culture & the Gluten Free Food! 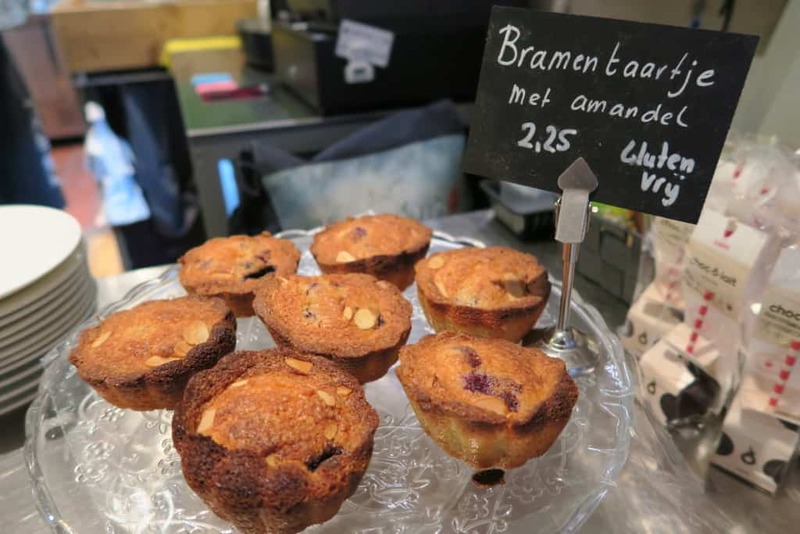 Gluten Free Friendly Cafes, Restaurants & Supermarkets offering plenty of Glutenvrij options are evident all over the place. Gluten Free in Amsterdam is a big thing! Yes that’s right remember Glutenvrij.. the most important phrase you will need! Oh & for dairy free, the term Lactosevrij is most common. 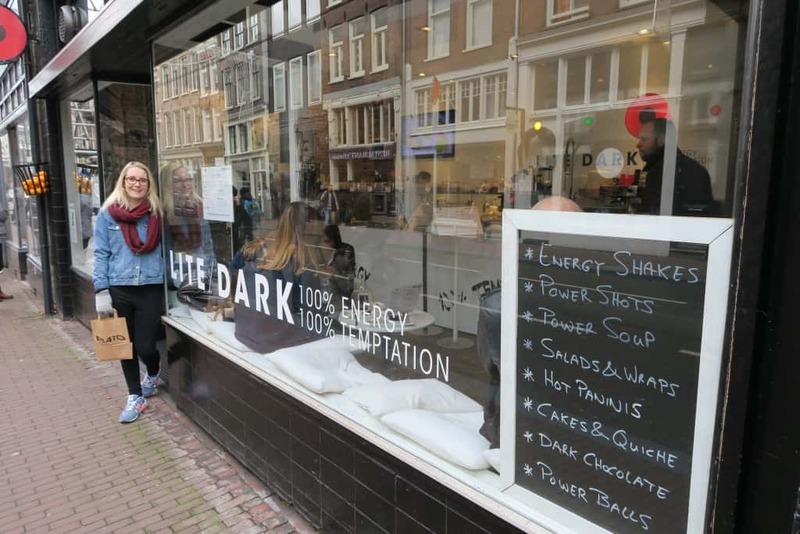 Here are some of my favourite Gluten Free Amsterdam Destinations… (In no particular order!!) 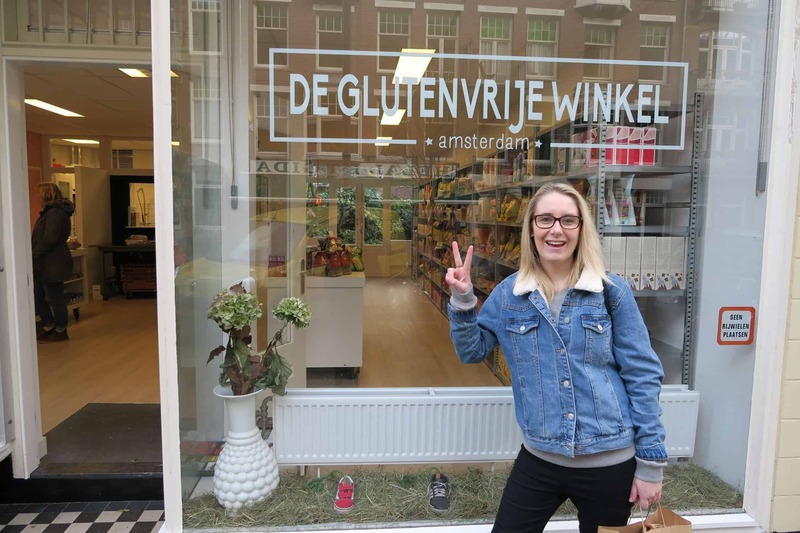 But first… here’s a Video Guide to Gluten Free in Amsterdam … scroll down for the full post! Bagels & Beans is the perfect place for a gluten free lunch. They are dotted all over Amsterdam, so wherever you are, you won’t be far from one. All Bagels & Beans offer gluten free bagels and not just any gluten free bagels… these bagels are the best I’ve had. Lightly toasted and warm they are accompanied by a delicious selection of fillings. 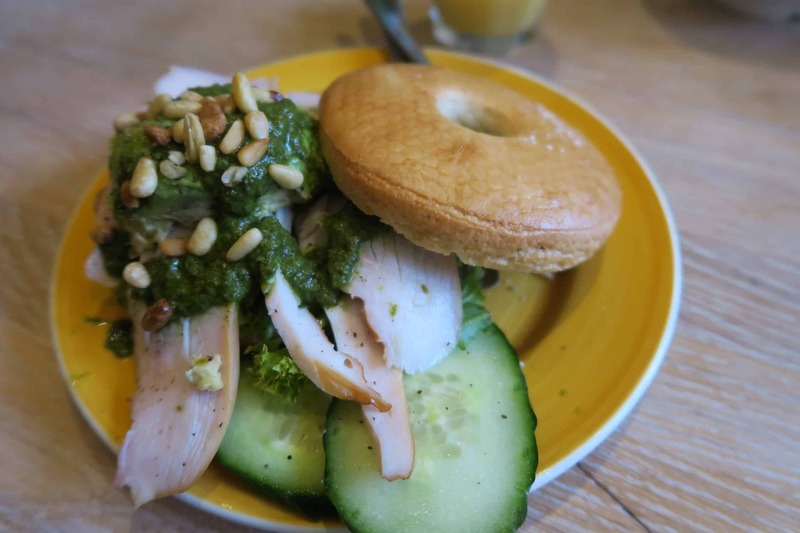 I was pretty much obsessed with their smoked chicken, avocado, basil dressing & pine nut gluten free bagel, so I would highly recommend that; however there is definitely something for everyone, sweet or savoury. You can grab a takeaway gluten free bagel as well if you fancy enjoying one outside by the canals. Oh & if like us you stay somewhere in Amsterdam where you have your own kitchen or you just want to bring some gluten free bagels home, Bagels & Beans sell gluten free bagels sealed to enjoy another time. Bagels & Beans provides gluten free in Amsterdam AND gluten free to takeaway! Piqniq is situated in a lovely area of Amsterdam, I loved our walk there! Piqniq offer a great selection of dishes and provide gluten free bread so you can enjoy all of their delicious sandwiches. They have a great selection of cakes as well with many being gluten free. Mark & I both devoured a slice of Snickers Cake which was not only glutenvrij but also lactosevrij & suikervrij (sugar free!). I also grabbed a gluten free blackcurrant tart which was beyond amazing too! Oh, and another thing, Piqniq also offer gluten free high tea if you are looking for somewhere special to enjoy an afternoon out. Everything about Piqniq is ace, & the staff were really friendly and very helpful. Almost forgot…. the hot chocolate is INSANELY good! Oh Pancakes Amsterdam, you are a beautiful place. Located pretty centrally very close to one of the canals (though everywhere is in Amsterdam! ), & always exceptionally busy! It is definitely worth the wait if you turn up & there is a short queue. Pancakes Amsterdam seemed to be fairly well known as a great place to enjoy both sweet & savoury gluten free & dairy free pancakes. 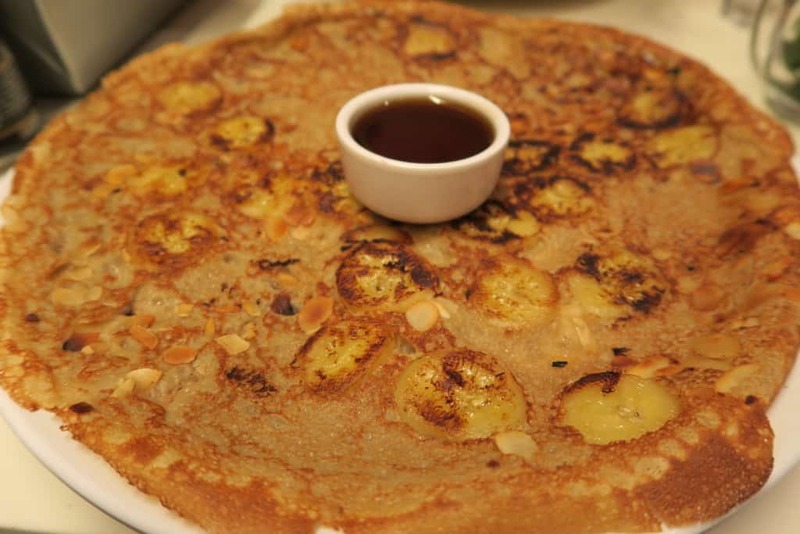 On the menu they have a large selection of favourites & dutch pancakes, all of which can be created gluten free. If you request a gluten free pancake, the pancake is also dairy free as they use soy milk in the gluten free mixture. I saw some amazing savoury pancake selections from folks around me, the goats cheese pancake looked to die for! However, both Mark & I went for sweet pancakes. I opted for apples, almonds & cinnamon whilst Mark went for banana & maple syrup. It was great that we could both enjoy each others pancakes too! It was actually nice to hear that the gluten free pancakes take a tiny bit longer to be made just because they need to be really careful. Oh & also you can even buy their own gluten free pancake mix to take home! We absolutely loved this place! A definite top recommendation for gluten free in Amsterdam. I don’t know how we came across Omelegg but I am so glad that we did. 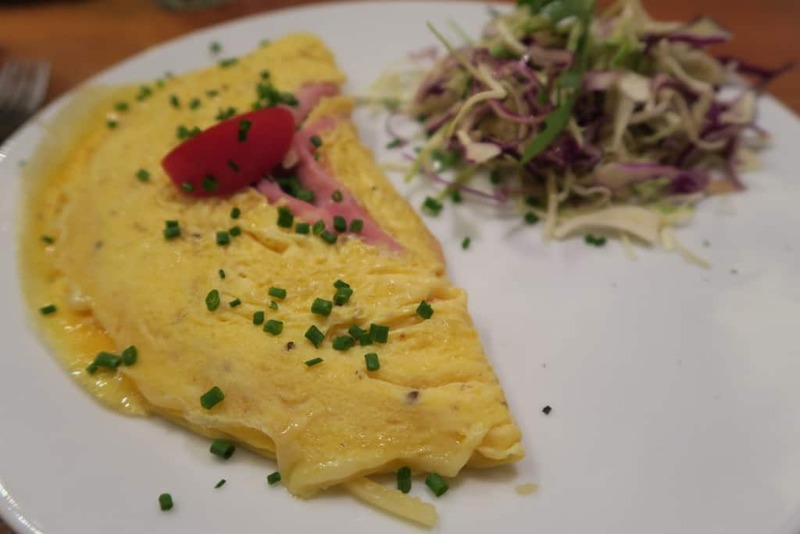 As the name suggests, Omelegg is all about omelettes! A lovely, safe gluten free dish! There are two Omelegg’s in Amsterdam, both have really extensive menus and are always busy. Lots of locals seems to enjoy a tasty omelette for lunch here. I couldn’t resist going for my favourite type of omelette whilst there… ham & cheese! Call me boring but you wouldn’t if you tried it… oh my, the cheese was amazing! So strong, and worked so well with the ham. The kitchen is completely open so you can see your omelette being cooked too which is nice. Omelettes come with bread as standard so just ask for no bread (this seemed like a common request anyway), you really don’t need it! They serve sweet omelettes too, like banana & peanut butter, I don’t really know how I feel about sweet omelettes, but if that’s your thing then they cater for you too! So I had heard that Amsterdam was the place to get gluten free McDonalds, I must admit I was buzzing! I haven’t eaten a McDonalds in ages, saying that, even when I could I wasn’t a big fast food fan… nevertheless, when a GLUTEN FREE MCDONALDS is on offer, you’ve got to say yes! So in the centre of Amsterdam there is one particular McDonalds that offered GlutenVrij! Not all of them do, so no need to go round asking which ones do. Click here for a map to the exact one I’m talking about! There are plenty more that do out of the centre & also there is one at the airport – perfect for the journey home! At present you can order a Gluten Free Cheeseburger, Quarter Pounder with Cheese & a Hamburger – all with a gluten free seeded bun. You can also order the Cheeseburger & Hamburger gluten free as part of a Happy Meal for the kids! McDonalds fries and also gluten free & they offer amazing looking salads too in Amsterdam so you literally will not feel left out. The gluten free bun was delicious & I would definitely have it again if I could! 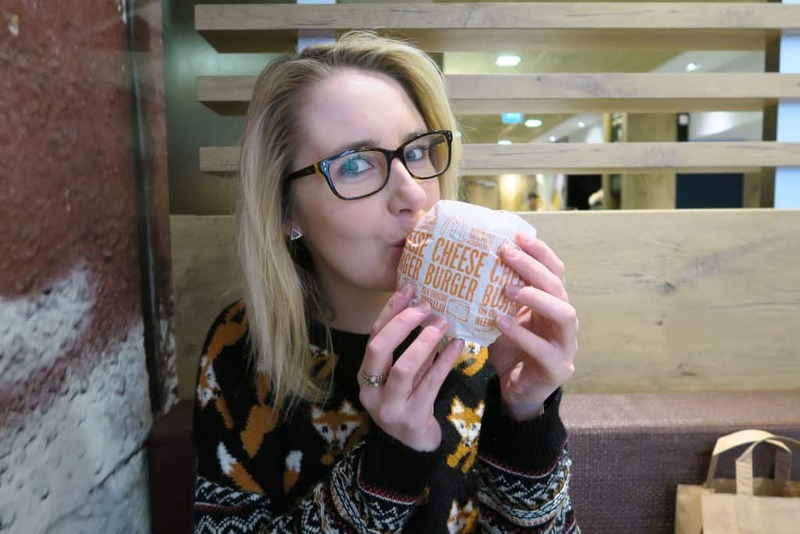 I know gluten free McDonalds has become quite a popular thing across Europe (minus the UK now! ), let me know where you have had gluten free McDonalds! When on holiday wherever I am, I always seem to find Italian food lurking about! Well I did when I could eat gluten but have found it more of a struggle since then. However, this was certainly not a problem in Amsterdam with a couple of Spaghetteria Pastabar restaurants in the city… one was quite close to where we were staying too! This is a restaurant that specialises in… pasta, pasta & more pasta. Oh & of course, it serves gluten free pasta too. I love the cosiness of the restaurant & for once the ‘community’ style tables somehow really work! The whole place just really works! So if you are looking for gluten free in Amsterdam for dinner, this is a great place to visit. 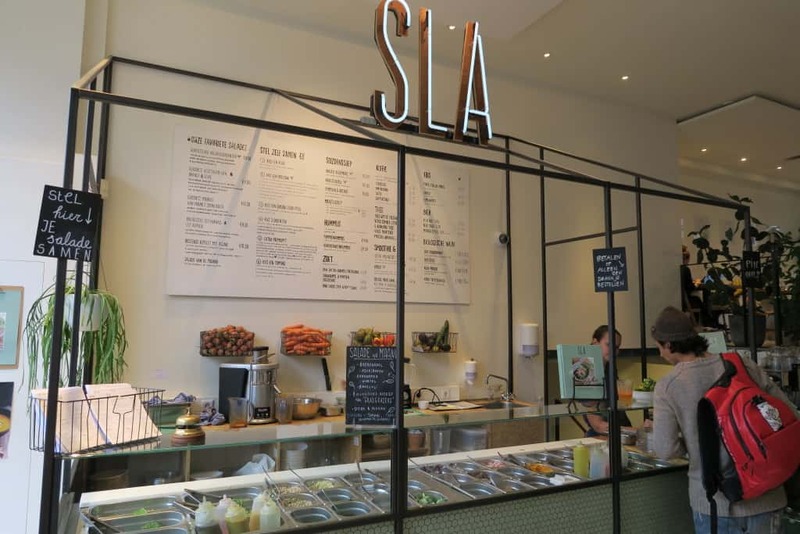 Sla is the place to go if you like your salads & juices. It’s a trendy destination that we spotted across the city & the choice of options a salad is really varied. It’s a very gluten free friendly destination with anything containing gluten having a symbol next to it on the menu… not many things do contain gluten! They even have gluten free soy sauce in their asian dressings as standard. Oh & the vegan choices are crazy too, so there is plenty looking for gluten free, dairy free & egg free. You feel healthy just looking at the food in Sla and not only that, the flavour combos are pretty sweet too. The Pink Summer Smoothie is amazing! 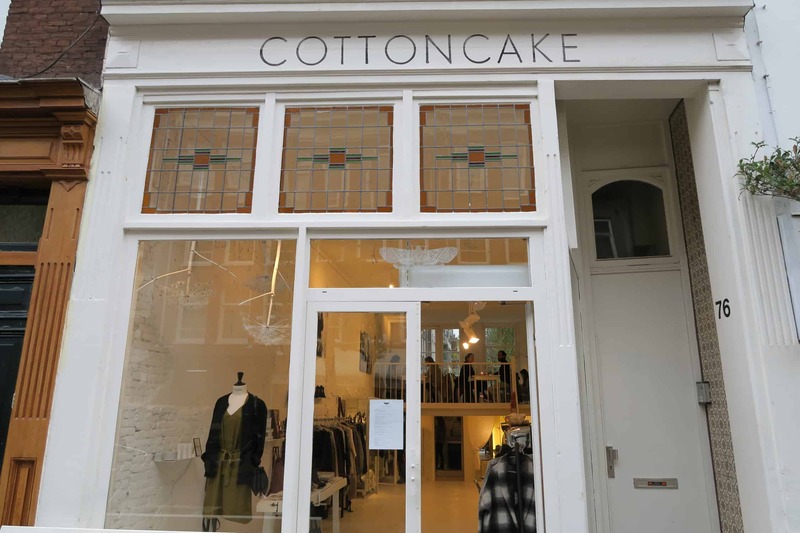 We were recommended to visit Cottoncake for gluten free in Amsterdam. When we arrived I was slightly confused as it just looked like a clothes shop. However, on closer look there a lovely little cafe within this shop right at the back! Open for breakfast, brunch, lunch & cake this place is just… cool! It has a menu full of gluten free options from banana breads to smoothie bowls, from frittata to flourless chocolate cake. I guarantee once you get inside Cottoncake, you will be so glad you came in. You wouldn’t expect this place from the outside to serve food, let alone gluten free food… but it does! Supermarkets in Amsterdam were very accommodating for the gluten free diet I found. We found it very easy to see whether a product was glutenvrij or not! Marqt was a higher end supermarket with a lot more organic & fresh items. Products here were slightly more expensive but definitely worth a look. The fresh fruit and veg smell amazing… but what I love most about dutch supermarkets in the massive fresh cheese & meat counters. It made me just want to eat cheese all day long! Marqt has a lovely gluten free section where you could buy gluten free and dairy free stroopwafels. You’ve got to try them whilst in Amsterdam, it will definitely ensure you don’t feel left out. They also have lots and lots of gluten free snacks & if you are staying in an apartment, the freezers are full of free from too. Well worth a trip just to stare at all the delicious food… oh & buy some truffle mayo from here… it’s amazing! 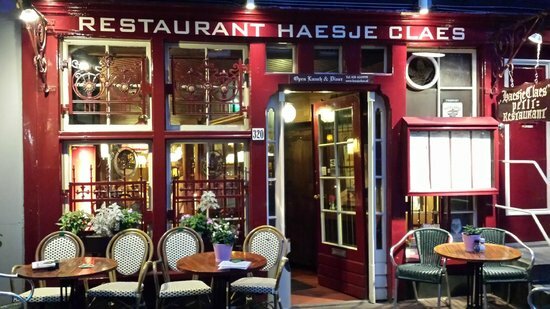 Haesje Claes is central & it offers a gluten free menu… perfect! The gluten free menu isn’t small either, it’s extensive & delicious. If you are looking to try some typical Dutch dishes that you can guarantee are gluten free then this is the place for you. There is a gluten free children’s menu too for any little ones who need to avoid gluten. Oh & for the not so little ones… gluten free beer is available too! Gluten free bread and butter is offered throughout the restaurant as well as gluten free breadcrumbs on the fish dishes. For me the Stamppotten (a traditional Dutch dish) sounded delicious as did the gluten free pancakes. 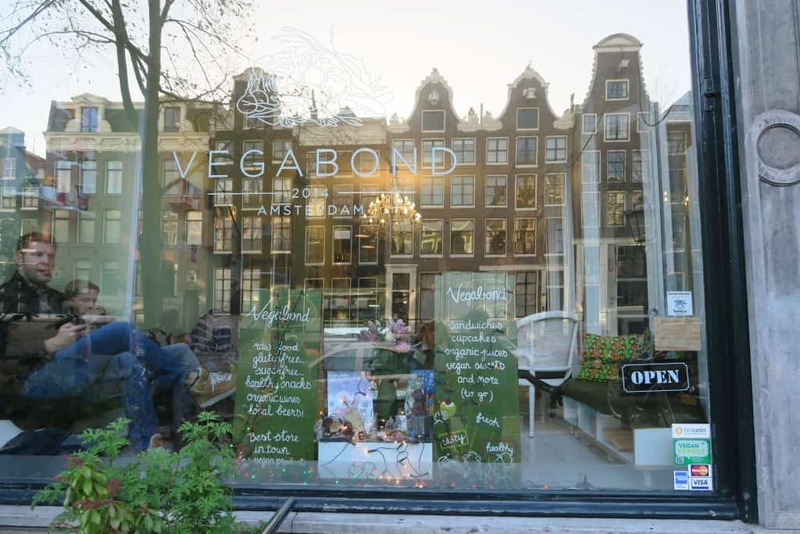 A dinner destination for gluten free in Amsterdam! To me, Albert Heijn seemed to be the number one supermarket in Amsterdam. They are everywhere! They are also full of gluten free! Every single shop I went into had a gluten free section full of Schär goodies and lots more. It’s the perfect place to grab some on the go snacks for all your busy days walking around the canals. If you are like me, you will love a quick nosey in Albert Heijn, just to see what the dutch gluten free aisle is like compared to the UK! Mastino is a pizzeria that every town needs. It’s 100% gluten free and vegan! It was the first of it’s kind in Amsterdam and they even make their own homemade vegan cheeses and gluten free pizza dough. Everyone fancies a pizza on holiday (well I do!) and when you see so much pizza out and about whilst in Amsterdam, you need to know where you can grab one that is safe & glutenvrij! Beter & Leuk was situated really close to where we were staying, which meant we had to make the trip there! Gluten free and dairy free freshly baked cakes can be found at the front counter. I enjoyed a delicious banana bread on one occasion, I wish the Beter & Leuk baker could bake for me every single day! Gluten Free is easily identified on the menu as well as vegan for those dairy free. Oh & I almost forgot this is another place in Amsterdam where you can get a gluten free high tea! Highly recommend a trip here for gluten free in Amsterdam, the staff are lovely too! I went on the hunt for Vegabond as I heard it was a vegan shop & cafe. I love vegan shops as they are some of the best places to find dairy free food for Mark. They often offer gluten free foods too, this was definitely the case at Vegabond. There was a large selection of fresh dairy free cupcakes & some delicious hazelnut brownies that could be enjoyed with a drink. Oh & of course lots of dairy free lunch options to enjoy in the cafe area too. What I loved even more was the shop area, it was filled with amazing gluten free & dairy free foods. The amount of dairy free cheese in the fridges was incredible, I wish we could have brought it all home! We found some amazing gluten free & dairy free chocolate bars too, of course the wonderful vego bars were there, but better still we found dairy free peanut butter cups, ‘mars bars’ etc. It’s a lovely shop/cafe situated near Anne Franks House overlooking a canal. A definite visit! La Vina had been recommended to me by numerous folk as a place run by a coeliac. It’s a restaurant known for it’s Mediterranean cuisine but more impressively, La Vina is well known as a restaurant that caters for gluten free as well as other allergens very well. The staff are incredibly knowledgeable & happy to advise about what would be best suited on the menu. A restaurant made for the coeliacs and gluten intolerants amongst us is a must visit in Amsterdam! Oh & I forgot.. gluten free bread & gluten free beer is definitely an option! A perfect location for those looking for gluten free in Amsterdam! Lieve is another top recommendation for gluten free in Amsterdam. 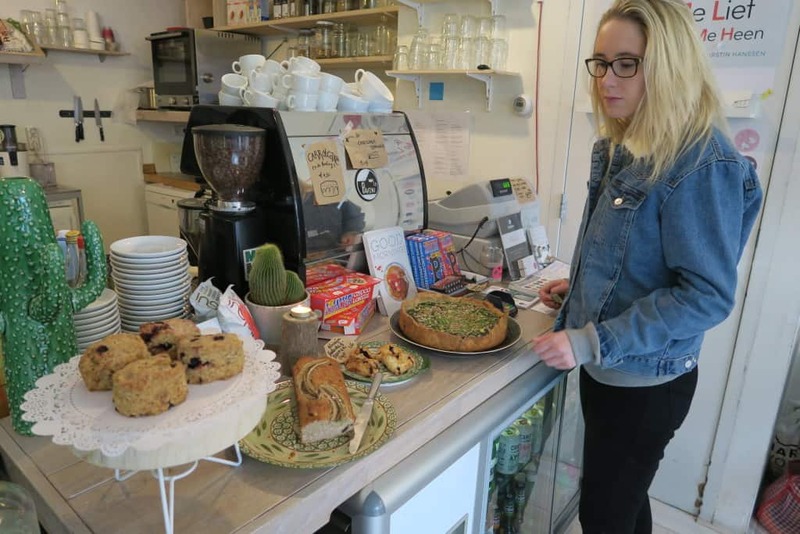 It has a great locations, set on one of the main canals in the city; & better still it’s the perfect destination for coeliacs, gluten free eaters & everyone else too! They not only have a gluten free menu, they also have a lactose free/dairy free menu which is very comforting. It is great to not feel like a problem & you certainly don’t in Lieve. Lieve is a restaurant is built upon a great concept of having 3 different areas to the restaurant. The 3 different ambiences: Mom’s Kitchentable, Belgian Baroque & Mrs. Bubbles all offer you as a diner something slightly different, so make sure you check them all out before you decide where you would like to be sat! Luckily all areas offer delicious gluten free food and lovely staff. For me, it’s all about Mom’s Kitchentable, but you might be different! Definitely somewhere to try & you can find all the menus online too. 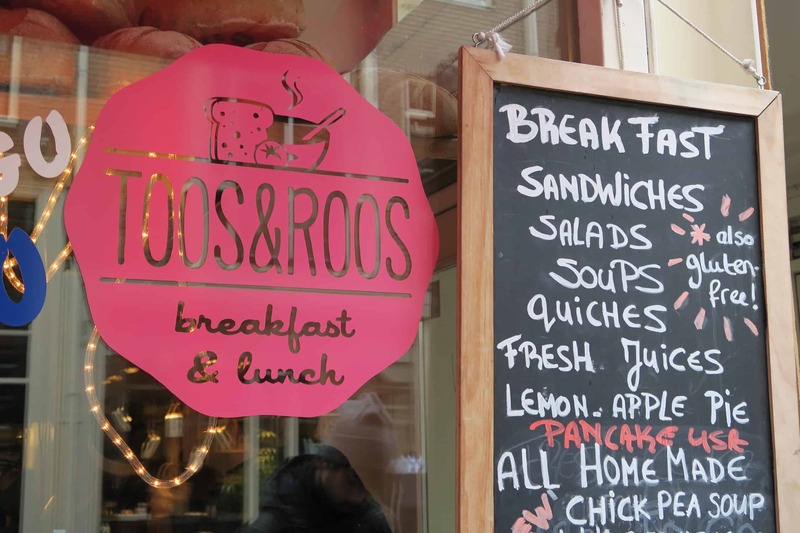 Now I came across Toos & Roos whilst I was waiting in a queue for Pancakes Amsterdam (featured above!). Toos & Roos is literally next door to Pancakes! Toos & Roos really caught my eye, I loved the sign outside and the whole restaurant looked really cute. I could tell just from how it looked that it might cater for gluten free & I was right! Toos & Roos can make any of it’s lunch time sandwiches gluten free, I’d recommend the Club Sandwich, it’s heavenly. If you go to Amsterdam & don’t have a club sandwich you are missing out… & you really don’t need to with places like this that offer gluten free bread. If you come to Amsterdam you must visit Pancakes, BUT I would highly, highly recommend you also visit Toos & Roos for gluten free in Amsterdam! We wandered across Lite/Dark completely by chance on the way into the centre of Amsterdam. It just looked as if it would offer gluten free & we were right! Lite/Dark is quite the healthy location but healthy and delicious all in one. This is a place where you can sit and enjoy some of the most amazing, energising fruit & veg juices Amsterdam has to offer. They also do a wide range of raw chocolate shakes & hot chocolates, perfect for those who cannot tolerate dairy too. Lite/Dark pride themselves on their healthy yet tempting cakes, scones, quiche & energy balls – nearly all of which are gluten free (many dairy free & vegan too). If you are looking for a bit of a cleanse, a delicious, gluten free one… this is the place to venture to. I am a massive sushi fan, Mark & I love making it from scratch at home & also love going out for it. In the UK we often go to Yo! Sushi as they offer gluten free soy sauce & if I am in London I often grab an Itsu on the go. But in Amsterdam we found a great All You Can Eat Sushi Restaurant called Sumo. What’s great about Sumo is they do offer gluten free soy sauce and also are very well informed about allergens. All you can eat sushi seems to be quite a popular restaurant type in Amsterdam, so if you fancy some, Sumo is the place to go. There are a few in Amsterdam, and they are all centrally placed too! It’s a perfect destination for sushi lovers & gluten free in Amsterdam. Oh Chipsy King! Amsterdam is a city that loves it’s chips. I don’t really know why, but everywhere you go you can buy a cone of fries to enjoy. 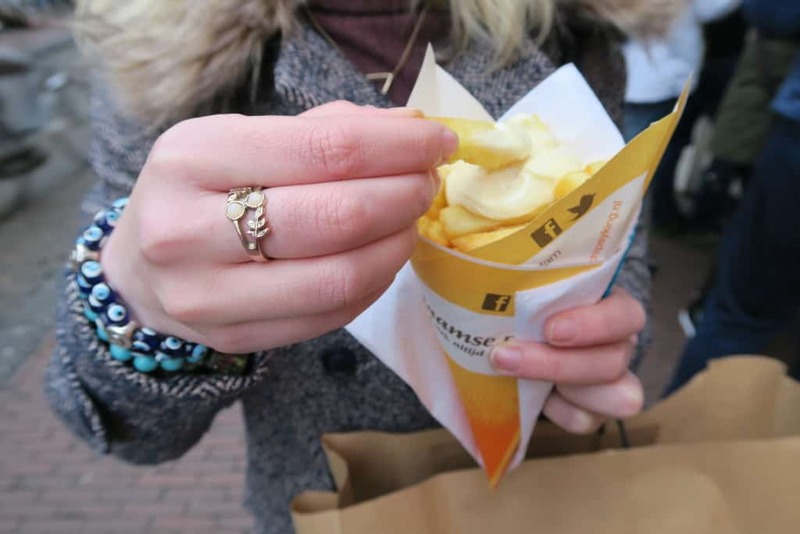 Another great thing about the dutch & their chips… they seem to love mayonnaise more than ketchup… me too! Basically at Chipsy King all they fry is chips… now it might not be the healthiest choice in the city but damn, it’s one of the greatest! Marks & Spencer: There is a Marks & Spencer in Amsterdam, yep that’s right! So if you like opting for a safer, more familiar option, the M&S food section has a free from aisle & plenty more gluten free choices in the chillers & freezers, just like in the UK. La Place: Almost opposite Marks & Spencer is also a lovely foodie place with quite a few gluten free options. La Place reminds me in some ways of aspects of Wholefoods. It has plenty of fresh food counters where you can pick up hot meals to go or to eat in. Everything is healthy and it smells great. You can see some of your food cooked in front of you, from pasta dishes to steaks and fish. Oh & there is plenty of allergen information everywhere. Mark & I have got into the habit of using Airbnb when we go on holiday & I just thought I would quickly mention it as another top tip for travelling gluten free. With Airbnb you basically rent out someones house/flat instead of staying in a hotel. They aren’t living there whilst you are staying and you have free run of the house/flat! It means you can use the kitchen! Personally I love this, we don’t fancy going out for breakfast in the mornings on holiday. When you have IBS the last thing you want to do is to overdo it at breakfast & mess up your entire day! In Amsterdam we preferred to just have some cereal each morning, which was possible as we had a fully fitted kitchen and a fridge to keep our milk cold. Additionally, some evenings we just didn’t fancy going out for dinner so we ate in! We grabbed a takeaway one night & cooked for ourselves another, it just makes life so much easier! & with the amazing amount of gluten free choice in supermarkets in Amsterdam, it just made sense. (It’s amazing value for money & there really are some dreamy places you can stay!) I would highly, highly recommend it! I hope you enjoyed my guide to enjoying gluten free in Amsterdam! What I really want to know is what are your favourite places to enjoy gluten free in Amsterdam? I only visited for just over a week so I’m sure I missed lots of great places! Leave any suggestions in the comments below or on Facebook/Twitter. Oh, & feel free to leave comments on my Gluten Free in Amsterdam YouTube Video too… Please Subscribe & Check out all my other videos too!